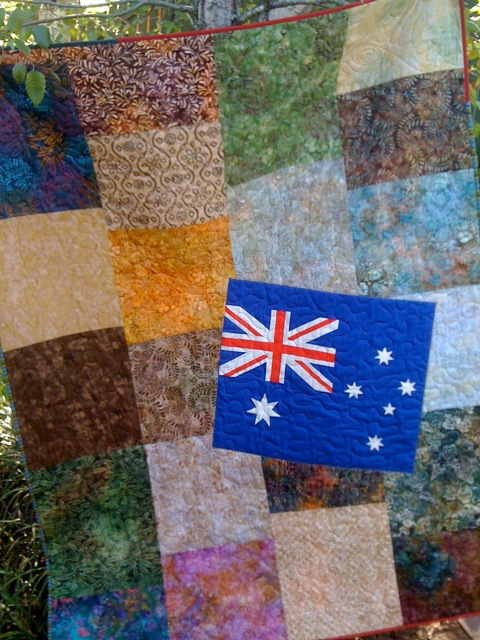 Aussie Hero Friends and The Singleton Quilting Machine! Okay! I have finally made a decision. 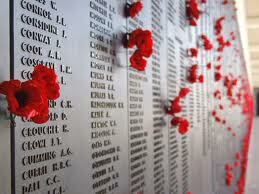 From now on those who sew for Aussie Heroes are known as Aussie Hero Friends of AHF. I think that is the most appropriate (although I quite liked Aussie Hero Shielas or Aussie Hero Kylies for their distinctive Australian flavour!). 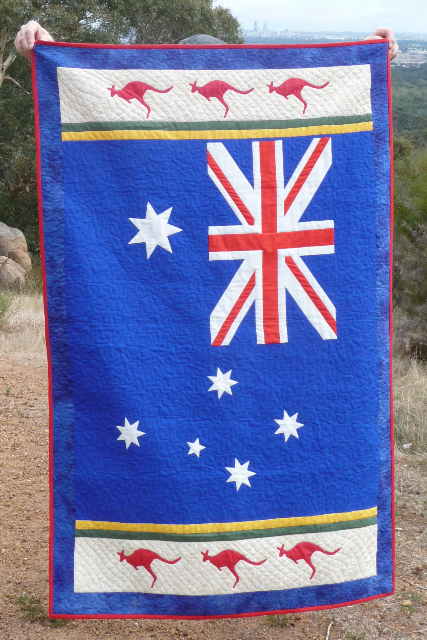 My feeling is that we sew for Aussie Heroes because we kindly disposed and appreciative of all the Aussie Heroes serving with such distinction for our country. I also think that if we could all meet I think we would all make some pretty awesome friendships too! So, G'day all you AHFs! Just a reminder that our May BOM will be launched tomorrow. We have done something different this month at Naomi's suggestion. She found a block that looked good and after checking with me emailed the author of the tutorial to seek permission for us to use it on our blog. Sophie, the author, has given her permission so tomorrow you will be seeing her really cool design. I have just finished my first one. The only hint I am going to give you is that is starts with a nine patch block made from 3" squares. That should be pretty simple seeing as we did nine patches back in February. We had an Aussie Hero Sewing Day today - except we didn't sew anything! Wendy and Claire were able to come and together we worked organizing a bunch of the fabrics that have been donated from various people. Claire spent the whole time folding and when necessary ironing smaller pieces of fabric to make them fit neatly in the shelves. At the start there was a big mess on the table and in the end the table was empty! Wendy started out sorting through all the 6 1/2" strips that were in my big pink bin. She managed to sort out 11 strips that will go together nicely for a quilt and then got all the rest organised to take home and work on. She has volunteered to get them all sewn together, then cut into 42" pieces and then sort them into groups of 11 for quilt tops! Wonderful. After she had done as much as she could do at my home she finished off helping Claire. It is so good to see that table empty and all the fabrics neatly stored on the shelves! While that was happening I manned the cutting table. The biggest pieces were cut into quilt backings, then laundry bags. Old sheets and some really (and I mean REALLY) ugly fabric was cut into laundry bag linings. Scraps were cut ito 6 1/2" strips, then squares and then smaller squares or binding lengths. Thanks so much for your help girls!!!! Hope you are not afraid to come back next time. And now some more quilt photos from that wonderful Quilting Machine - the Singleton Quilters! They have now sent 42 quilts on their way! Oh, and to answer the question "How many quilters are there in the Singleton Quilters?" 35! So almost two quilts each! Great effort ladies! Standby for the May BOM tomorrow night. Till next time...............keep spreading the word and happy stitching! How awesome do these quilts look! These are three BOM quilts, the first two are the nine patches from February - this yellow one will be marked for a girl. It has a lovely yellow and white floral backing and with the little bits of pink in it I think it is too soft and pretty for a guy. Hopefully these photos make it a bit easier for you to pick out your blocks if they are in there. I really like the secondary pattern that you get with this one - the result of all the "lights and darks" being in the same place in each block. I always think it is amazing that you can have two very different fabrics in the one quilt and because it is a scrap quilt it just works when you look at the big picture - for example the african masks and the lady bugs. And finally the pinwheel quilt from the March BOMs. I think this is pretty much gender neutral don't you think? A big thank you goes out to Carol for doing a lovely fast job of stipple quilting and binding these four quilts for me! 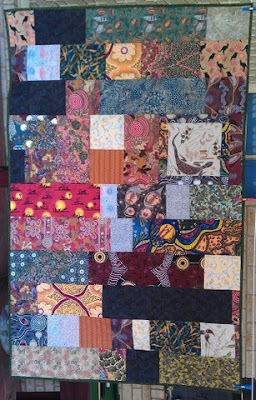 There is one more nine patch BOM quilt to go but it is being completed in by Larissa in the NT. With a little toddler of her own, who has been ill recently, it might be a little longer before we see it but it will be ready when it is needed I am sure. This lovely quilt top was made by Gail! I really love this one. I think I told you before that Gail makes those tiny 3" finished nine patches to use up scraps and when she has enough she makes a quilt! How is everyone going with their April BOM blocks? A couple of people have told me they are working on some. Is anyone else working on them or are you all waiting, with rotary cutter blade poised for the May BOM? No hints tonight, but I am hoping to get my first one sewn tonight. I just may give you a hint tomorrow. All is ready for the Aussie Heroes working day tomorrow. We were going to be layering three quilts but when Carol dropped of the above four she took those three with her to quilt for me again! Thanks again Carol! So, we will be getting straight on to cutting up some of the donated fabrics into backings, laundry bag liners and laundry bag outers. I need to get the fabric sorted and folded as much as possible this week as it is driving me nuts where it is. Weeks ago we received about 6-7 huge garbage bags of donated fabric. I have gone though it and separated out the stuff that we can use and the stiff we can't and now it is time to stow away the fabric we are keeping. Cutting some of it up in advance will save some space. Soon I hope to get a couple of dress maker types to come and identify the fabric we can't use so that I can list it on ebay and see if we can raise some funds for AHQ. A few dollars are always handy to buy batting, cording, thread,. rotary blades and so on! Till next time.................keep spreading the word and happy stitching! Do you remember that lovely soldier that I told you about here who requested a quilt that he could enjoy in Afghanistan and then take back home and give to his daughter? Well I put out a call for a volunteer to make it and Christine was the first one to put her hand up to make it. Well, it is finished and on its way. Gorgeous colours and a great touch having the Aussie Flag on it too. And of course Christine made a laundry bag to go with it. By the way if you are interested in seeing some of the ANZAC Day footage from various places around the world, including Tarin Kot and Al Minhad Air Base just look here. 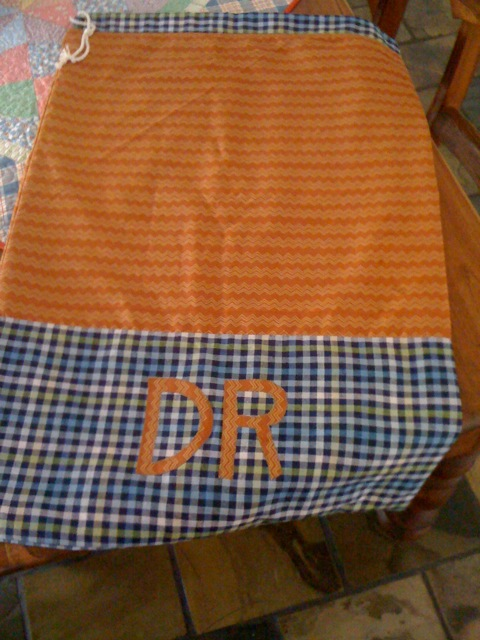 One of the fellows that has requested a quilt was kind enough to send me the link. 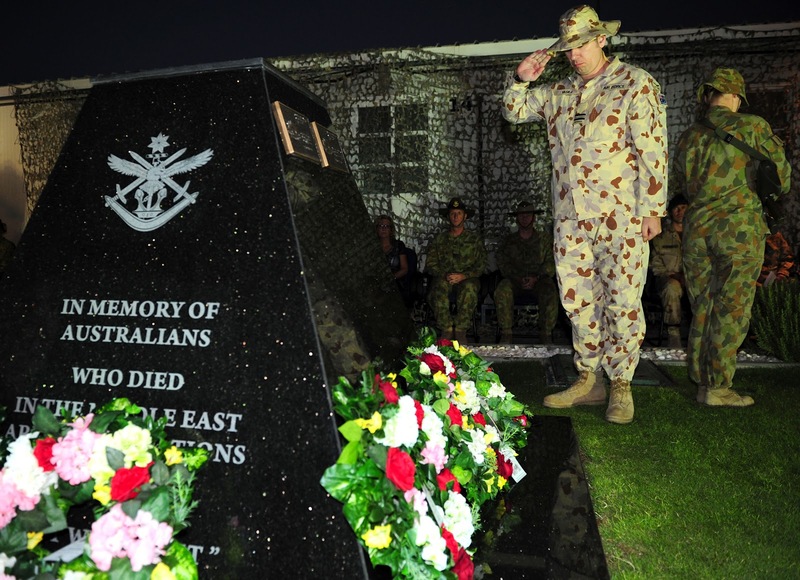 He also sent me a picture of what ANZAC Day was where he is. You might notice the gentleman and in the suit with his wife next to him. They are Mr and Mrs McCarthy, the parents of Sig Sean McCarthy who was killed on active duty in Afghanistan in 2008. They attend the service at this location every year. That is rather humbling isn't it. What sort of trip must it be for them every year. If you would like to see some other pictures from the day you can look here. I haven't had a chance to trawl through them all yet but I will be and I will be searching to see if I see any familiar faces. My hubby and I sat in the car waiting for Fly Boy (number 1 twin) to come out from Youth Group tonight brain storming lots of names. Not all of them were exactly helpful given his sense of humour and Pauline came up with a bunch too but her sense of humour is a bit like my hubby's so I picked out the possible ones from here and added them to the list. I am still thinking about it - there must be something just perfect and catchy that we can use - please leave a comment if you have any suggestions or if you really like any of the above. He is only little as you can see and that is why he only needs a little quilt! I think that will be my project for this weekend - that and tidy up the mess that has become my dining room lately - fabric and blocks and stuff everywhere. Don't forget that the next Aussie Hero Sewing Day is on Monday. Leave a comment if you can come! I have more photos to share with you of quilts that are on their way to Afghanistan. This one was made by Heather from the Turramurra Quilters. It is a disappearing nine patch and I really like this layout! This isn't a second quilt - this is actually the back of the above quilt. The next eight are from the Singleton Quilters. What a great bunch of quilts! If you have a few spare moments you should check out this blog. Tracey at The Peony Teacup is having a give away and in the same post she has encouraged people to get behind and sew for Aussie Heroes. Why don't you go over and check out her blog and say thanks for giving a shout out to us. We have a few days left until the end of the month and that means a few days left to make some BOMs. I have had a few emails about them in the last few days so I know there are some of you out their making some. Leave me a comment if you are planning to send some so I know how many to expect. 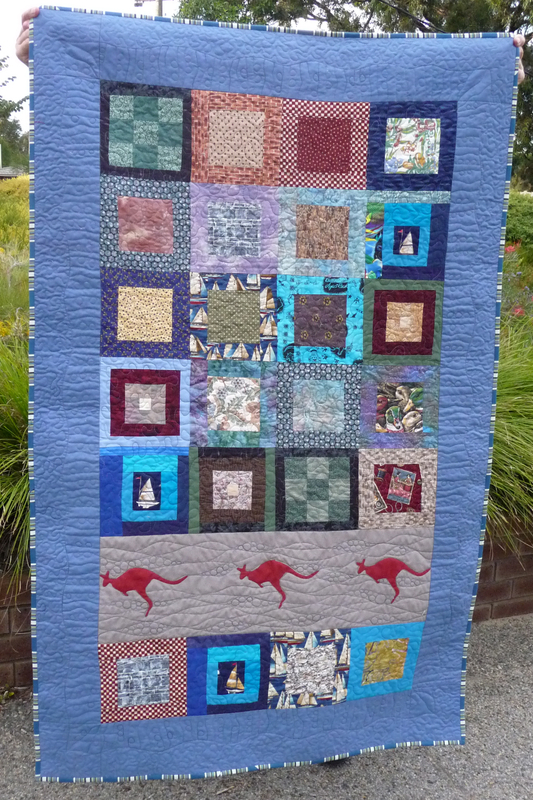 This bunch was made by Claire from Turramurra Quilters and myself. I think I might have taken a few people out of their comfort zone with this wonky block. Well, nevermind, the next one will not be wonky I promise. And check out what Maria has been doing- two wonderful quilt tops! I hope everyone had a nice day yesterday. For me there is something special about ANZAC Day and I usually spend most of it sniffling through the TV broadcasts and the radio programs. I love listening to the diggers, old and young, talk about their experiences - not the loss and destruction, but the mateships and determination to strive against the hardship. So inspiring. my quilt group decided to go ahead with our regular fortnightly meeting yesterday as it would be possible for two of our girls who have had to go back to full time work to join in with us for a change. Before I went however i sent a special message to the service men and women who, over the last few months, have made contact with me. I went back through all the messages and emails that you have all sent me and picked out the bits that explain why you wanted to get involved and why you think Aussie Heroes is a good idea. I figured if you enjoy hearing their messages of thanks then they would enjoy reading your messages of support as well. I was a bit nervous that the message might be a bit......soppy..... perhaps not the right word but you know what I mean but my hubby said to send it so I did. Thank you for sharing this with me and I am hopeful that you don't mind me passing these words on. This morning I stood here on foreign ground to remember all those who have fallen for our country, those who have been injured and those who have and are still serving in all parts of the world. I must say today being away from home and my children not only made the true reason of ANZAC day ring true in my ears, it made tears as it does every year run down my face. So to hear these words of support to us serving members is wonderful and touching. Well we are about half way through or ANZAC day here and to be honest it is one of the most remarkable ANZAC days I have ever had. To be paying tribute to the fallen in the country that they have paid the ultimate sacrifice is a feeling that is very hard to describe. The mixed emotions of pride and sadness come over you at different times but to be amongst mates whom you have shared the battlefield with is very satisfying. I hope you have had a great day yourself and you and your loved ones are well. The kind words you have sent from your "Army" of workers has been passed on to the boys and they are very grateful. To know that people, from all generations, are supporting us in our task is not only encouraging but also very humbling. We really do thank you and your crew from the bottom of our hearts. As I watch the celebrations from back home, and from around the world for that matter, it is pleasing to see that the young people are going to carry this tradition well into the future and beyond. To see them in places such as Gallipoli, France and Turkey and of course Australia really is fantastic. You would have to be an extremely hard person if those pictures didn't bring a tear to the eye and a swelling to the heart. The ANZAC's are in very good hands. On behalf of the SOTG I wish to thank you and your AMAZING staff again for EVERYTHING they are doing for the men over here. I fear that these words in an email can never really express the gratitude we wish to express to you all. Please pass on our thanks and best wishes to all your ladies and may they be safe and always free from harm. Just makes you want to sew a little bit more doesn't it. We have a few months now to sew before we can start sending off quilts to the Middle East again and hopefully as word spreads of our efforts we will get some more requests. I know a few people are going to start sewing and there are already a few quilts underway or completed like this lovely one by Liz from WA. Don't you just love her quilting! This photo is now in a special file I have called Quilts in Waiting. What that means is that when I get a special request from someone I will refer to the quilts in waiting and if I think there is a quilt suitable to fill that request then I can send an email straight to its maker with details of who to send it to. if anyone else out there has quilts underway it would be great if you could also send me a photo so that I can place it in the Quilts in Waiting file. My feeling is that it is great to keep a flow of quilts, even if it must be a trickle at times, heading over there so that the name Aussie Heroes keeps spreading and so that more people learn of they support they have. I have had a suggestion that I call you all Aussie Hero Angels instead of Aussie Hero Sewers (I really don't like the word "sewists"). What does everyone think? I think you are all angels! And while we are on the subject of sewing more quilts - one smart girl in Tassie managed to take advantage of recent specials in Spotlight and scored a whole bunch of Australian Flag Panels for very little outlay. She has offered to make them available to other Aussie Hero Angels (?) so more fabulous flag quilts can be sewn. I think these panels are great for all the AHQs but even more so for WWQs if you are planning to make one. Her name is Kathy and she is happy for you to contact her via her email (stitches_63@hotmail.com) if you would like to have a panel or two - thanks heaps Kathy! who has given us the freedom to domonstrate. who had given us the right to a fair trial. who gives the protestor the right the burn the flag. I really need a better name for all of you lovely ladies. It is a bit long winded to say Aussie Hero Sewers and also a bit impersonal, but whatever you are called you are the best. All the requests from last night have been taken. Quilts to all with be heading off to the Middle East within the next few weeks. More people have added their names to the list of volunteers.......Just wonderful! A few emails I have had have started me thinking that we should all share the various things that we do to get things to include in the boxes: goodies to fill in those nooks and crannies and the make up the weight! I told the guy at our local Spar supermarket that I was making a few goodies to send over and asked if perhaps he would like to donate a couple of D.V.Ds. Guess what ...he said yes and let me choose twenty of them. I only expected a couple if he had said yes. But twenty was great and so very nice of him. You know I asked a Victorian tea towel company for a few tea towels and they sent us 30! The latest person I asked was my friend who owns a music shop. I wanted to know if he could donate a few harmonicas for me to include in the Christmas boxes and he came good. Here are five! Apparently, particularly in the outstations the guys like to sit around the fire are night and play these so they have something to do with their hands. If the guy who receives it doesn't want it I am sure he will be able to pass it on. So, why don't you give it a try. Just ask and you might be surprised at the response. Most people are really happy to be supportive and they may not always be able to give you something but they are usually polite at least and usually very supportive. And if they start waffling on and being negative about our guys and girls being over there just smile sweetly and remind them that we are supporting the man not the mission. If you have been brave enough to ask for a donation how about sharing! Labels: what donations are you asking for? I received another lovely thankyou email today and this one is for the golf themed quilt that I made. You can see it here. But what is lovely about this email is that it is not just about the quilt I made but mentions many quilts. My comments are in black. What can I say? Words escape me as I try to thank you for the lovely quilt you have made for me. My quilt arrived yesterday as did J's (another Chaplain) and one for a Wounded Warrior (Wendy's). I have mine in my office for display, so don't be surprised if a few of my mates here contact you. (bring it on) Your generosity is overwhelming and has brought tears of appreciation to my eyes. I sit here looking at the beautiful green of the golf course (in the middle of a desert you will appreciate how nice that is to me). Some of the guys who we call 'Special' (SASR) have also received theirs and as tough as they are, your quilts have raised their morale and more and more want one. So know that your efforts are being very much appreciated. You (and this means all of us!) bring a little bit of home into our lives. Sigh! Got to love those emails! As the last two of our first three WWQs hit the post offices today I thought I would show you all three together! This top was sewn by Turrnamurra Quilter Claire and the quilt was completed by Caz. This one was completed by Liz from WA. And this was completed by Wendy from Vic and has already arrived. Don't forget to let me know if you wish to be put on the volunteer list to make quilts when some are requested. Just remember if you say yes to completing a special request we like to try and get them in the mail within two, at most three, weeks to ensure that they get to their recipient in a timely manner. At the same time though, also remember that these quilts do not have to be fancy - simple construction is fine. I have received four requests in the last 24 hours. One I have decided to take on myself - well I allowed to do some of them. The second i referred to Erika who has offered a few times and has just been pipped at the post. Also I know she has some quilts on hand and that request was for 2-3 quilts. The last two requests are for one quilt each and I have just sent out an email to my list of volunteers. And just a quick update on pink quilt. I have finished the top and the backing and I am really pleased with how it turned out. Having two boys I don't think I have ever had the pleasure of working on such a pretty pink quilt! I am hoping to layer and pin it on Wednesday if my hubby can help me or Thursday morning at the latest on my own if I have to. A new Aussie Hero lady has volunteered to quilt it for me and another friend is going to finish it off with the labels and a special little angel that she is embroidering! I want to get it done so that I can get on to the special request that I have decided to do myself. I received a lovely email from a fellow last night who asked for a quilt for himself - nothing new about that - but he also asked for a special one for a VIP - Craftsman Belvedere - soon to be Corporal Belvedere. But why is he a VIP? 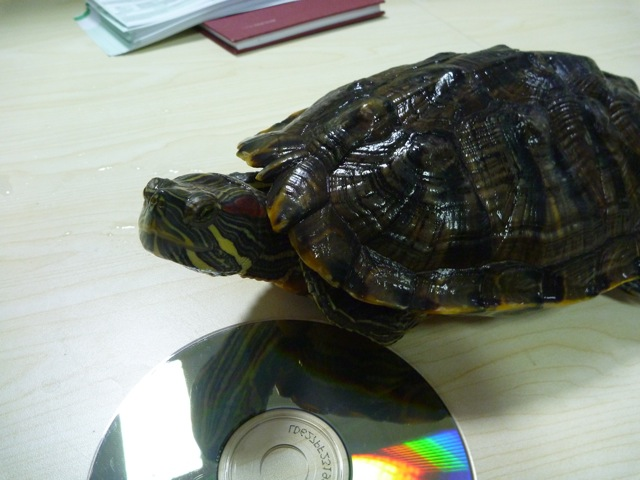 Because he is a mascot - Belvedere the turtle! Don't you just love it! 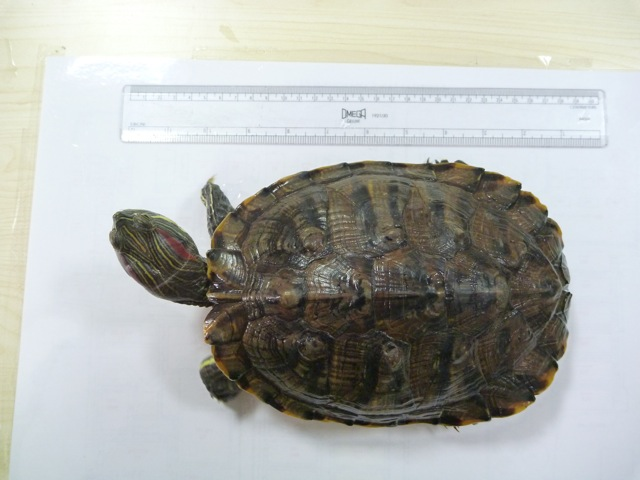 And he only wants a turtle sized quilt - A3 sized! So as you can see I have a very important quilt to sew! That's it for tonight - absolutely hoping I can get this out as the data is GONE! I just received a couple of emails from the father of this gorgeous little angel. Guess who she is. She is the special little girl that will be receiving the girly nine patch quilt that so many of you have contributed to. For privacy reasons I won't share her name yet but I can share this message from her Dad. 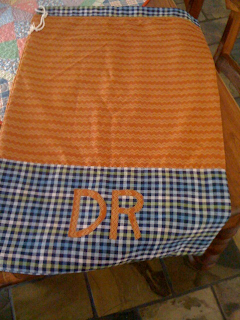 He has now seen the quilt top in progress on the blog and here is part of his email. "I cannot say thank you enough for all the effort you lovely people put it (Aussie Heroes). Also a special thank you to everyone that has worked on my daughter A's quilt. A was in hospital for most of the week due to an unknown virus. Its the first time one of my children have been admitted to hospital and I have to say it was probably one of the hardest weeks I have experienced over here. You are trained to deal with a lot of things prior to coming over here, but when it comes to family back home, you feel so helpless. Thankfully I have such a beautiful and supportive wife who has helped put my mind at ease. A is out of hosiptal now and recovering just in time for her birthday. She turns 1 on the 13th of May." So glad to hear that she is out of hospital! I sent him a reply and then not long after I got this quick message. "I have spent all afternoon on the Aussie Heros blog catching up on what I've missed. 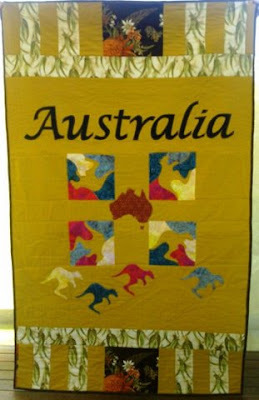 Thank you thank you thank you to all of the Aussie Hero quilters. And a special heart felt thank you to all the quilters who have worked on A's quilt. I have to admit I may or may not of shed a tear or two when reading the blogs and comments." Um, no this is him! Not sure who the blonde guy is but I think he needs to see a bit more sun! Apparently this winter has been much colder than normal. He said this was his second time experiencing winter in Afghanistan and this was by far the worst! Now if that doesn't make you feel really good about being an Aussie Hero Sewer nothing will. That is all I have for you tonight - I am rushing to get this out before our internet limit disappears completely - thanks to my boys and their enthusiasm for computer games over the holidays we have used 99% of our 500GB limit. Thank goodness I have my iPad. I just don't know how to add photos to posts in the iPad so I don't expect I will be back till Wednesday morning. But in the mean time I will take lots of pictures and will have lots to tell you. Stand by for photos of our first three WWQs. They will all be in the mail as of Monday. Hopefully by Wednesday A's quilt top and back will all be together too. I can still send and receive emails and can write posts on my ipad, just can't work out how to add photos to them! So I can let you know if anything important happens which isn't really very likely! Thank goodness my ipad is on a plan! So, I may see you tonight or tomorrow night, or I may not, but I will be back on Wednesday at least, and hopefully with lots to show you. Thank goodness my hubby is home for the weekend and I don't have to weather the internet dieting teens on my own. Good heavens! What will they do? I have some great quilts to show you today. These were made by Rita, a lovely American lady I met at Country Pickin's. She has sewn Quilts of Valor Quilts and when she saw the Aussie Hero Quilt display at Country Pickin's she jumped right into sewing for us too. She has made three really lovely quilts. Unfortunately she sent me the photos but no explanation so I am going to have to guess. This first one is obvious - a great scrap/crazy quilt. Some really fun details in this one. I think this is the backing for it. Then there is this great sunflower quilt. Again I am loving the traditional layout! And finally, my favourite. A quilt made from blue jeans! Now I not sure which is the front and which is the back. Love both sides actually. Check out the Aussie Map stitched in the middle of this one. Had to include this picture - cute pup! And I think maybe this is the back? Still really cool. I might have to save some old jeans too. Even if I have got the descriptions wrong they are all still wonderful quilts! There hasn't been much talk about BOMs this month. I am assuming that everyone has been too busy finishing off their quilts to get them in the mail and then taking a breather! Yell out if you are planning to send some. I bought some more reds and blues the other day and have got as far as cutting the squares out and the white strips. Hopefully some sewing over the weekend. There just might be no time to post tomorrow as I have a hot date on the sofa catching up on the entire season of Amazing Race with my Amazing Travelling Hubby - not so amazing when he comments on places they are racing that he has been to and I haven't! He has traveled all sorts of places over the last 16 years while I have been with the boys at home - even Mongolia! Anyway, I will be back without fail on Sunday! Till then............keep spreading the word and happy stitching! Ahq Sydney Sewing Day and MORE! One last day to post tomorrow! Oh My Goodness on 3 days left to post! All Sorts and 5 days to go! Volunteer List and Finishes Galore!